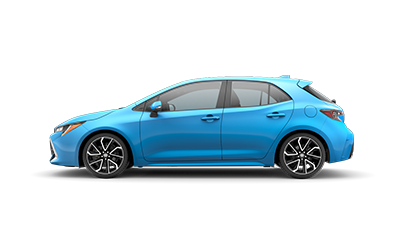 MSRP excludes the Delivery, Processing, and Handling Fee of $920 for Cars (Yaris, Yaris iA, 86, Corolla Hatchback, Corolla Hatchback HB, Corolla Hatchback, Corolla Hatchback HV, Prius LB, Prius c, Prius Prime, Mirai, Corolla Hatchback, Corolla Hatchback HV), $1045 for Small/Medium Trucks, SUVs and Van (C-HR, RAV4, RAV4 HV, Highlander, Highlander HV, Corolla Hatchback, Sienna, Tacoma), $1,295 for Large SUVs (Sequoia, Land Cruiser), and $1,395 for Large Truck (Tundra). (Historically, vehicle manufacturers and distributors have charged a separate fee for processing, handling and delivering vehicles to dealerships. Toyota's charge for these services is called the "Delivery, Processing and Handling Fee" and is based on the value of the processing, handling and delivery services Toyota provides as well as Toyota's overall pricing structure. Toyota may make a profit on the Delivery, Processing and Handling Fee.) Excludes taxes, license, title and available or regionally required equipment. The Delivery, Processing and Handling Fee in AL, AR, FL, GA, LA, MS, NC, OK, SC and TX will be higher. The published prices do not apply to Puerto Rico and the U.S. Virgin Islands. Actual dealer price will vary. $1,999 customer cash due at signing. Offer excludes applicable taxes, license, and fees. Lease is example only and applies only to new 2019 Toyota Corolla Hatchback Model #6272. Lease available only through Toyota Financial Services to well-qualified buyers with premium-rated credit. No security deposit required. You pay excess wear and tear, plus $.15 per mile over 36,000 miles at lease end. Lease Cash is only available through TFS and must be applied to special lease offer. Lease payments may vary from dealer to dealer based on final negotiated price and equipment chosen. Example vehicle may not be available at all dealers. Must take delivery by 4-30-2019. Offer available only through Toyota Financial Services to well-qualified buyers with premium rated credit. 60 monthly payments of $17.48 per thousand borrowed. No down payment required if qualified. Offer ends 4-30-2019. 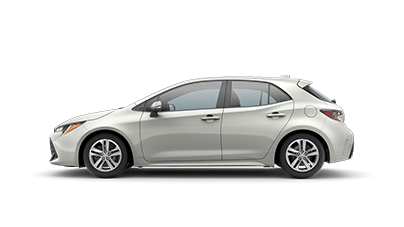 Customer purchasing a new, unused and unlicensed, from dealer's ground stock inventory 2019 Corolla, Corolla Hatchback and 2019 RAV4 Gas between February 5, and February 28, 2019 and financing Toyota Financial Services (TFS) at a non-subvened rate is entitled to TFS Cash if they meet the following conditions: 1. Customer is using non-subvened APR financing offered through Toyota Financial Services (TFS) (i.e. offer is not eligible with customer cash offers, TFS subvened, or retail financing done with financial institutions other than TFS). 2. Contract Date and retail date on the RDR are within the same program period. 3. TFS APR Contract term is less than or equal to 72 months. 4. TFS APR contract rate is non-subvened. 5. Amount is being applied as a non-cash credit to the amount being financed (i.e. no payments will be made directly to consumers). Offer ends 4-30-2019. You like it cool. Your passenger likes it warm. And with Corolla Hatchback's available dual zone automatic climate control, you can both ride in total comfort. Corolla Hatchback features a stunning 8-in. multimedia touch-screen command center. Its standard Entune™ 3.0 Audio system puts your favorite options at your fingertips with a customizable homepage and App Suite with available Entune™ 3.0 Toyota Connected Services. And with features like standard Apple CarPlay™ support, Scout® GPS Link compatibility and the available 8-speaker, 800-watt JBL® speaker system, you'll find even more reasons to take the long way home.